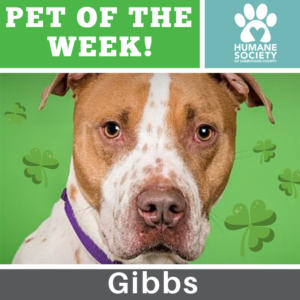 Get in the St. Patty’s Day spirit by adopting your own four-legged lucky charm – Gibbs! He is a handsome three-year-old boy, who will melt your heart. Gibbs is a little shy at first, so make sure to take the time to get to know him out of his kennel… once you do, he is an absolute sweetheart. Because of his extended length of stay, Gibbs is part of our current Adoption Special. This means his adoption fee is only $60. Will Gibbs be your “pup” of gold at the end of the rainbow? Find out more about Gibbs here.